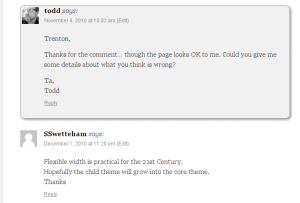 As a sequal to the debut entry of the “WordPress 1 Minute Wonder” series which talked about styling author comments differently to other comments this post extends the usefulness of your comments by adding Gravatar Hovercards to you site/blog. This posts presumes that you know what Gravtars are (if not check them out). Again, in true WordPress 1 Minute Wonder fashion this is a dead simple thing to enable and involves nothing more than copy and paste and (s)FTP access to your site. In fact before I show you the steps I should credit the guys at WebBlogToolsCollection for this… in this case I simply a messenger. So to get this working simply copy and paste the following code into your theme’s function.php file (create one if it doesn’t exist). This should give your comments’ avatars a nice hovercard affect if you hover over them. It’s that simple and useful… brilliant. To get the most out of this feature (on your site and on others that you comment on) make sure you update the info on your Gravatar profile. This is the first in the series of my 1 Minute Wonder series for WordPress where I’ll be showing simple and quick tricks for WordPress to add a little extra to your blog or WordPress powered website. And in this series debut I’ll be showing you how to add extra styling to the comments made by the post author. So a quick caveat… this trick depends on your theme’s implementation… hopefully it’s been created with all the correct semantic markup needed. If you find this doesn’t work then to resolve the issue may take slightly longer than the one minute. What we’ve done here is added extra styling to give the author’s comments a background specific background colour with a nice rounded border and a subtle box shadow. The rounding of the corners and the shadow are created using CSS3 so may not show on older browsers. 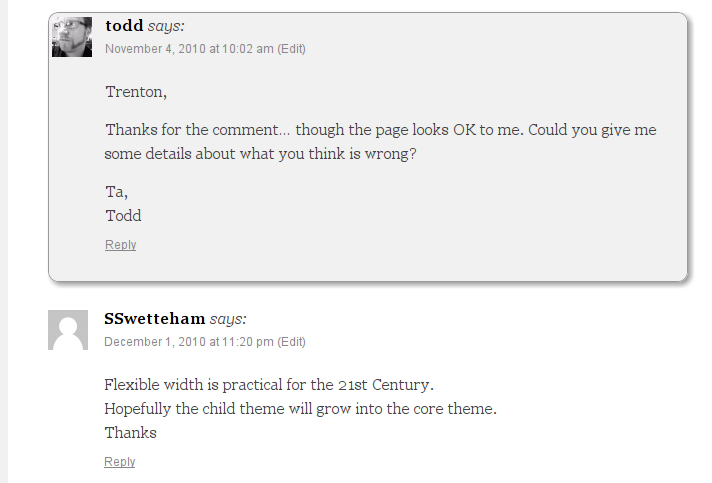 This styling can be seen on this very blog over at this post on the Responsive TwentyTen child theme for WordPress. Of course the comment can be styled in any manner of ways depending on the CSS you apply.